​​​​​Your Number one source for all types of Industrial Gears and Pinions. We're dedicated to giving you the very best of Industrial Gears, with a focus on 100 % assured and dependable quality, customer service and Quick deliveries. We now serve customers all over India, and are thrilled to be a part of the Industrial Gear Manufacturers wing of the industry. My experience with Marshall is second to none. The process from initial inquiry to receipt of the goods was faultless. Quotes, documentation and delivery were on time as promised with outstanding quality despite numerous changes and requests. SVP - Walchandnagar Industries Ltd.
Marshall is one of the good Gears & Pinion suppliers in our database with a proven track record for quality and delivery performance. We hereby certify that Marshall is a Pioneer Industrial Gear Manufacturer. We look forward to continuing the professional association for years to come. Marshall is supporting us since more than 3 decades for getting complete Gears. We appreciate QC measures adopted by Marshall to achieve desired surface finish on gear teeth and gear profile. Excellent quality and commitment in delivery. Highly Recommended. Founded in 1975 by Sri. Ajit.S.Arora, Marshall Engg. Works has come a long way from its beginnings in a small Industrial Gala at Chakala, Mumbai. When Sri. 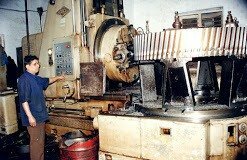 Ajit.S.Arora first started out, his passion for providing world class Industrial gears to customers across India drove him to setting up the largest Gear hobbing machine shop in India. Through persistent hard work, invested time and efforts of the MEW team, the finest Gear manufacturing factory was set up and gave us the impetus to turn hard work and inspiration into to a booming business. With this ongoing journey Marshall has emerged from a gears manufacturers to a diversified component manufacturer and in its multi- diversified group of companies. We now supply gears and pinions to Cement Plants ,Sugar Plants, Steel Re-Rolling Mills, Turbine Plants, Steel Plants, Power Transmission Plants, Mining Industry- Gold, Coal, Mineral, Fertilizer Industry, Paper Industry, Material Handling Equipment Manufacturers, Earth Moving Equipment Manufacturers, Handling Equipment Manufacturers, Harvesters Manufacturing Industries and various other O.E.M’s ( Original Equipment Manufacturers).